Two days off from work left me with a little time to do a lot of things. I bought Marlene Koch’s new cookbook, Eat More of What You Love, and I’ve been wanting to try some of the recipes out of it. I had bought some blueberries from Sam’s Club that were begging to be made in to coffee cake (from her first book) and I had some bananas on the counter that really wanted to be made into banana bread. Well wouldn’t you know it, she had a recipe for that in her new book. Let me just start by saying, sorry I don’t have a picture of the banana bread. When I took the picture, I couldn’t figure out why it was so dark. I later figured out that I hadn’t changed the exposure back since the concert this past weekend. But this banana bread used molasses, Splenda, bran flakes and wheat flour instead of the normal sugar, brown sugar and extra stuff that’s no good for you. Given, one piece is still 120 calories, but that’s an after lunch treat I can afford. If you’re a lover of banana bread like I am and have some bananas sitting around that you should have eaten days ago, try out this recipe. 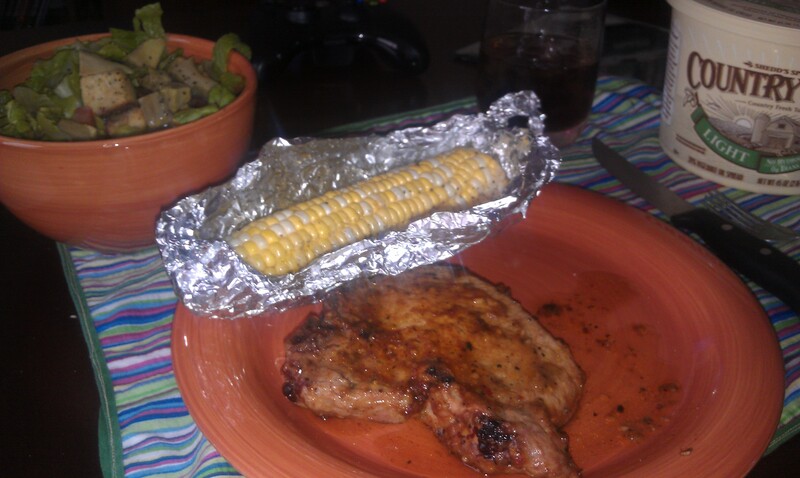 My dinner adventure also came out of her new book, though I altered it just a smidge. Its a chicken sandwich with barbecue sauce and bacon (and healthy?? What?? ), and instead of the lettuce, I used avocado. I also mixed some hot sauce in with my barbecue sauce. 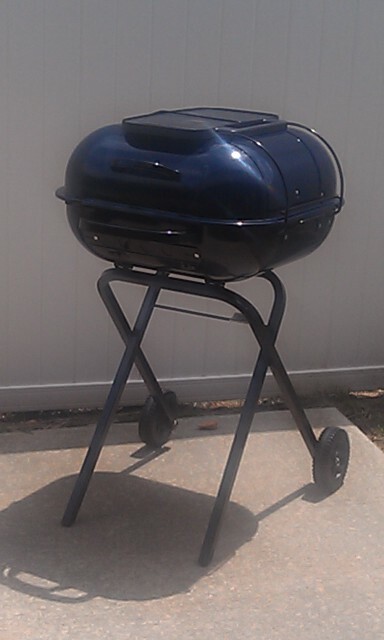 Chicken breast, pounded, and seasoned with salt and pepper then cooked (grill or pan, your choice). Cheddar cheese, barbecue sauce, a wheat bun, lettuce, tomato, and a piece of bacon. Done. So an update about the diet. Weekends as of late, not so great for me. I get too excited about a Saturday and my honey being home and cheat too much on my diet. Or I have a really bad day at work and have a Jack and Coke or two. But during the week, I’ve been really good. Like eating salad every night, and only going over my calorie count by maybe 100, very seldom. Working out, I don’t run as much as I should, but when I do work out, I push it. And guess what? My little accomplishment this morning… I fit back into a smaller pair of my jeans. Not as well as I used to, but before the wedding I couldn’t even get them buttoned. Yay! The past couple of nights, making dinner has been an adventure. I’m having to modify my way of doing things a little bit to make sure that I’m staying within my calorie count. Instead of just saying, “Yeah that looks right,” I’m actually measuring things, and I’m not doing a whole lot of improvising these days. I guess as we grow older, things have to change a little right? The real challenge I faced yesterday. I had to go back to work at the restaurant, where I had to physically think about not grabbing a french fry or downing a cup of soda, which I’m so used to doing while I was there. I am almost dreading working doubles because I am going to have to bring my mid-day meal to resist the temptation of getting something stupid unhealthy. So, on to the food. The whole reason people read this blog. The other night, I pulled out one of my other cookbooks, and this one I’ve mentioned before in a post and in a recipe. It’s the Eat What You Love by Marlene Koch. This time I found her recipe for a Chicken and Broccoli Alfredo, and instead of using the heavy cream and butter with tons of parmesan to make an alfredo sauce, she uses lowfat milk and cornstarch to imitate the creaminess of the sauce and then only a little bit of parmesan and I’m thinking that because the cheese doesn’t have to penetrate as much sauce, a little bit goes a long way and it’s absolutely delightful. And, the broccoli is basically steamed in the microwave which makes for super easy preparation. And I got to have pasta! On a diet! It was a good day. So then last night, I decided to try something that I wasn’t one hundred percent sure that my hunny would enjoy, but that I had never tried to make and that only had 187 calories per serving. That would be Stuffed Peppers, and goodness gracious did they turn out pretty. Now, out of the three go-to cookbooks for this diet adventure, the only recipe that I could find for a low-cal version involved using the meatless soy crumbles instead of ground beef. I had pulled out ground beef, I was going to use it. I had bought some deliciously colored red, yellow and orange bell peppers at Sam’s Club and they were calling me to make this dish. (Have you ever noticed that the more pretty an ingredient is, the more you want to eat it? It goes right along with that whole eat with your eyes first mantra.) Therefore, I turned to my friend Google and found a great recipe. And guess what? My hunny loved them. And we both decided that the meat mixture that goes into the peppers would also taste really good wrapped in a tortilla with some cheese. 1. Cook the pasta according to the package directions while preparing the sauce, and set aside. 2. Place the broccoli in a large microwave-safe dish. Add 3 tablespoons of water, cover, and microwave for 4 minutes, or until crisp tender. 3. In a medium saucepan, whisk the milk and cornstarch until smooth. Whisk in the broth and place over low heat. Add the cream cheese, garlic powder, and pepper. Bring to a low simmer and cook until the sauce thickens, about 4 minutes. Whisk in the Parmesan and cook for 1 to 2 more minutes, or until sauce is smooth. 4. 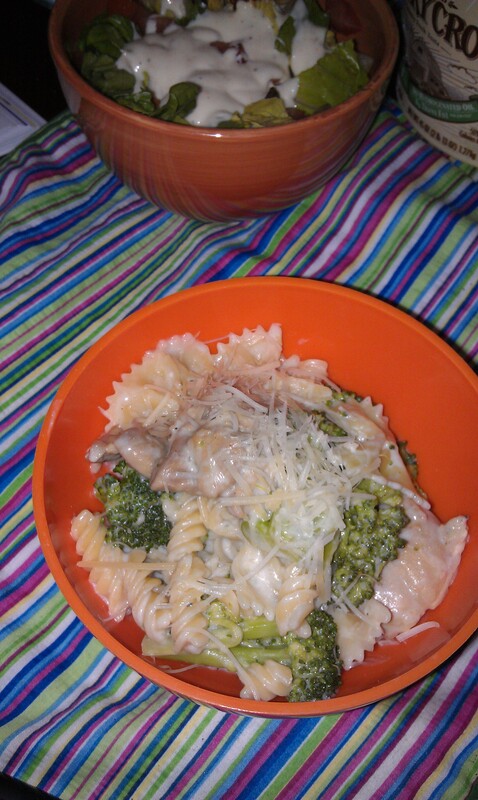 Toss the cooked pasta, broccoli, and chicken together in a large serving dish. Pour the sauce on top, and toss gently to combine. The Army says I need to lose some pounds. So lose some pounds is what I’m going to do. The honeymoon is over, and my hunny has agreed to help me out with this by eating “diet food” for dinners. He’s such a good husband. Of course, I’m going to combine my dieting with exercise… though that part is harder for me than the watching my diet part. This diet I’ve done before, and it worked rather well, just took a lot of discipline. It’s only allowing myself 1400 calories a day. No fast food, no soda, very little alcohol unless I have calories left in my diet. Tonight I got to have a beer. So, since I’ve already invested in a couple diet cookbooks, I decided that I should probably start using them. The first one that I’ve delved into for the past two nights is called Cook Yourself Thin Faster. 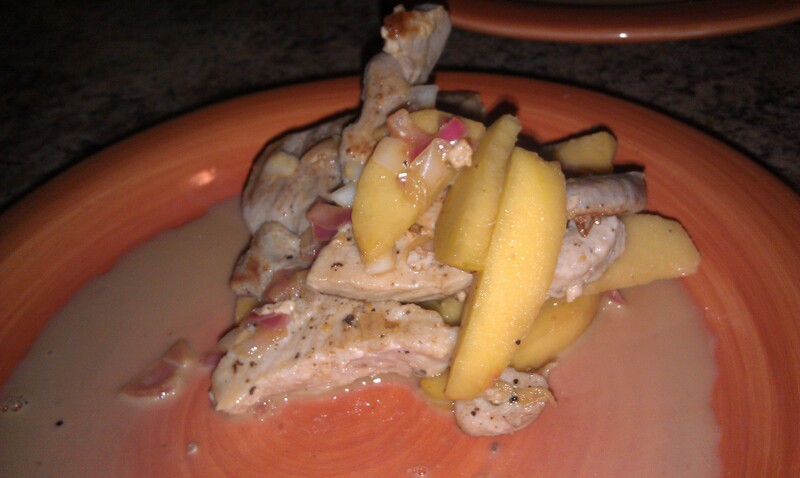 Last night was porkchops with apples. It was surprisingly tasty. There was a sauce that went with it that was made with the apples, shallots, apple cider vinegar and a couple teaspoons of heavy cream. It was delightfully tasty. We balanced out the tanginess of the vinegar with a simple salad. Stay tuned for more tasty diet friendly food. And go buy the book for more tasty recipes! 1. Lightly pound the pork with a meat mallet or rolling pin to flatten slightly. 3. Lightly spray a large saute pan with cooking spray and set over medium high heat. 4. Add the pork to the pan and cook 3-4 minutes. Turn and cook for another 4 minutes, until cooked through. Remove the pork to a plate and keep covered. Saute the shallot and apple until slightly golden. Add the apple cider and cook until the liquid begins to boil. Add the heavy cream and stir. Return the pork to the pan, toss with the sauce, and serve immediately. We just had the most amazing wedding back home, and to celebrate, we traveled 9 hours to New Orleans. Being the food lover that I am, I was in heaven. Every day I made my hunny try something new, and surprisingly, we didn’t find anything he didn’t like. We agree that I’ve never led him astray when it comes to good food. Day one was simple. We had been driving all day, so we ate in the hotel restaurant. My hunny had a fried shrimp po-boy, which we found to be much better when not fried (more on that later). Day two, once we were well rested was much better. It started with room service – surprisingly decently priced. 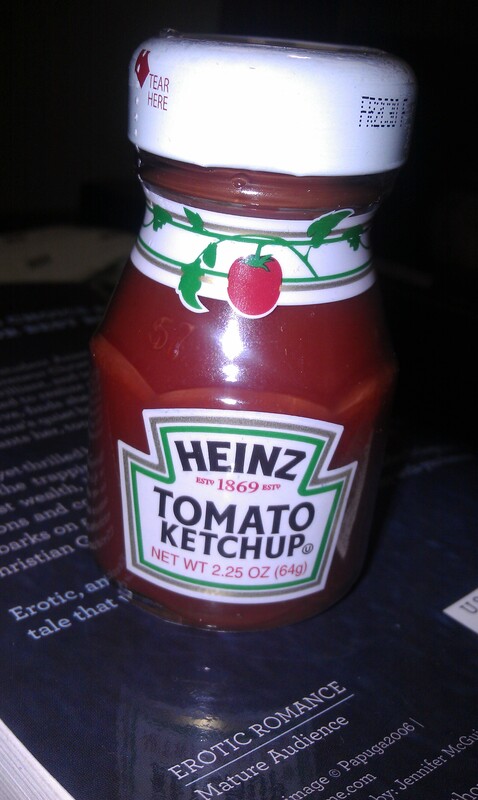 Check out the cute little bottle of ketchup. I get a kick out of things like that. Later, we had muffalettas from Central Grocery. I’ve heard that it’s definitely a tourist place, but it doesn’t matter, they were still super good. 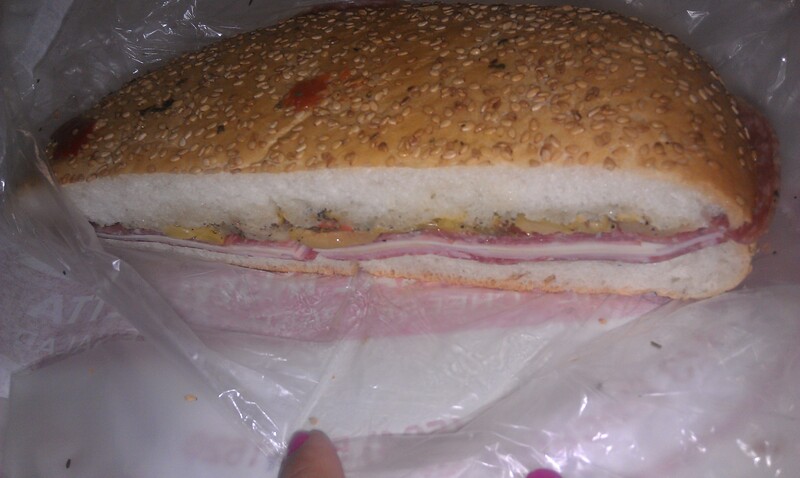 For those of you that don’t know, muffalettas are sandwiches that are made on a round bun with layers of yummy meat and cheese. These also had a really tasty onion and pickled carrot mixture on them. We bought a jar of that. My hunny thought they were so good that we went back on day three for lunch. Day four meant breakfast at Cafe Du Monde. 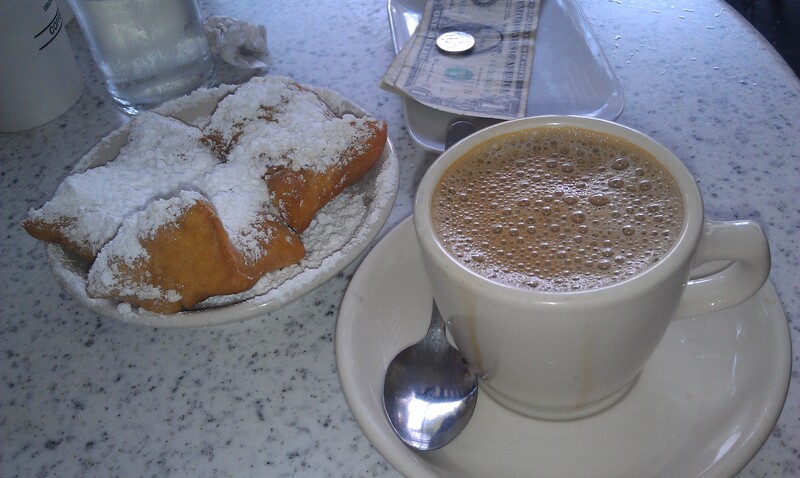 Beignets and Cafe au Lait. Beignets are french doughnuts that are covered in powdered sugar. Cafe au Lait is french for latte. Yummy! I may or may not have bought a can of the coffee with chickory and a box of beignet mix. Did you know that Cafe du Monde has a gift shop? And the cafe is open 24 hours. Weird for a place that serves coffee and doughnuts. Our last day there, we spent a lot of time wandering, and we took a cemetery tour. Our guide was funny and delightful, as well as being in New Orleans most of his life. I asked him for the best place in the French Quarter to get gumbo. He said the Gumbo Shop. Boy was he right. We got a small order of seafood gumbo, a boudin sausage, and then a shrimp po-boy. This po-boy was not fried. 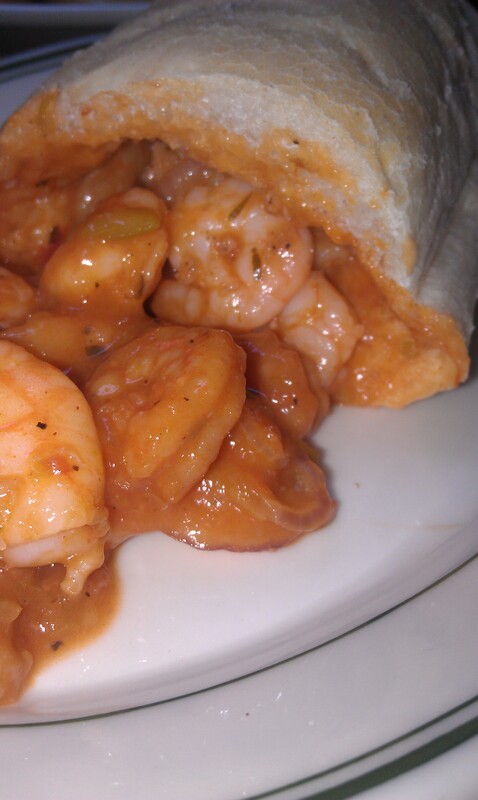 Instead the shrimp was tossed in a delightful and slightly spicy tomato sauce. And instead of the spectacular french bread being cut in half, this was actually bored out before it was filled. 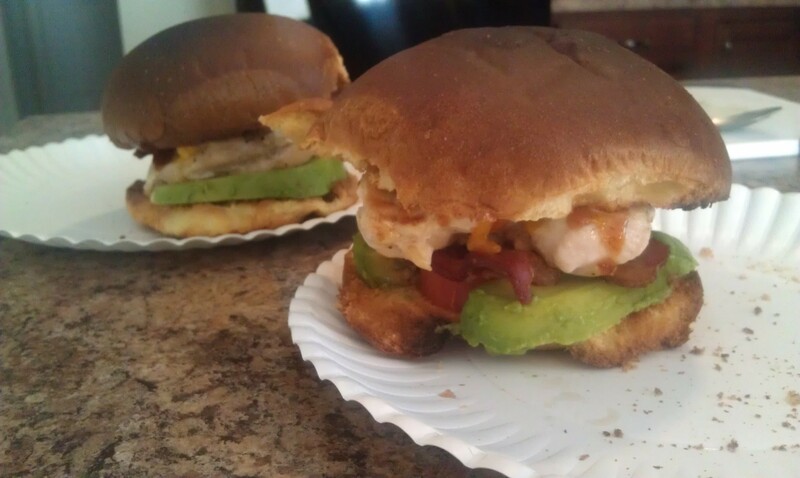 It made the outside crunchy, the inside soft and chewy, and allowed the shrimp to stay in the sandwich. De-lish! 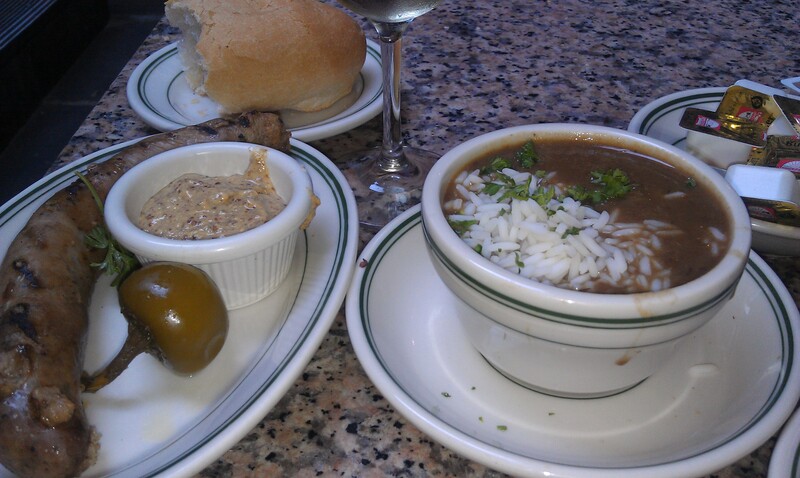 Did I mention we got all this delicious-ness without leaving the French Quarter? Call us tourist-y, but it was totally worth it.